NASHVILLE, Tenn. (June 5, 2017) – At an event to celebrate Preds Pride Day, Mayor Megan Barry proclaimed Nashville Predators center Ryan Johansen to be Honorary Mayor of Nashville for the Day, followed by an unveiling of a temporary sign for 5th Avenue South to be renamed ‘Predators Way’ for the month of June. 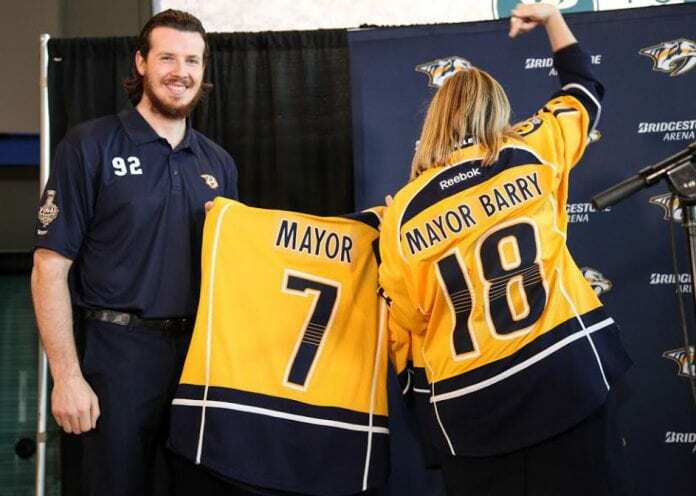 Mayor Barry cited Johansen’s impressive performance throughout the regular season and amazing 13 points scored during the playoff games against Chicago, St. Louis and Anaheim in naming him honorary mayor. She also cited his commitment to the Make-A-Wish Foundation during his offseason last year as a reason why it was fitting for him to receive this title. Mayor Barry delivered the proclamation to Johansen at the Preds Pride Day event on the heels of the Nashville Predators amazing 5-1 victory over the Pittsburgh Penguins in Game 3 of the Stanley Cup Final held on Saturday, June 3. 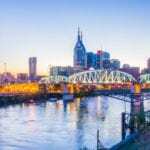 Preds Pride Day coincides with Game 4 tonight at Bridgestone Arena, and all people in Nashville are encouraged to wear their favorite Preds gear or gold clothing to celebrate this historic occasion. Councilmembers Sharon Hurt (At Large), Freddie O’Connell (District 19), and Dave Rosenberg (District 35) also delivered a proclamation from the Metro Council honoring the Nashville Predators for their historic achievement in advancing to the Stanley Cup Final.